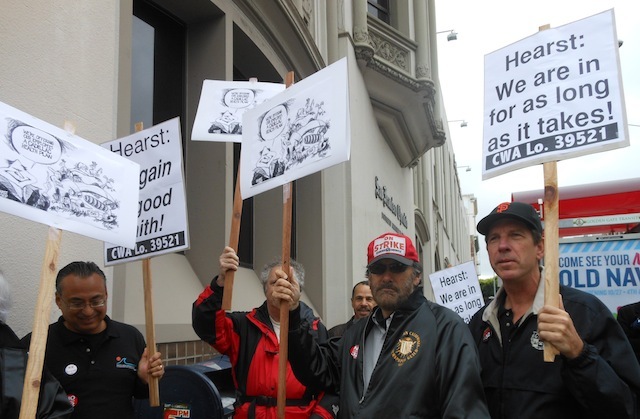 Guild members and their allies will gather Thursday outside the Chronicle building in downtown San Francisco to protest the New York-based Hearst Corp.’s attack on quality health care at the newspaper. Detailed flyer here. It will be one of the first public demonstrations by San Francisco media workers since the newspaper business began its long economic slide and Hearst threatened to shut down the Chronicle in 2009. After years of sacrifice and layoffs, Chronicle workers are fighting now to maintain decent and affordable health care. That’s the central economic issue in negotiations for a new labor contract at the newspaper and its popular SFGate.com website. The previous Guild contract lapsed in June. The company has stonewalled in the talks, postponing or canceling meetings repeatedly while refusing even to make a coherent offer. The Chronicle Guild unit, a part of the San Francisco-based Pacific Media Workers Guild, demands a fair settlement to resolve a financial crisis in the Guild’s health coverage – a crisis Hearst’s own local managers saw coming way back in April. Union members plan to wear Guild shirts — or anything “solidarity red” — to show support on Thursday. Top Bay Area labor leaders and elected officials are expected to add their muscle to the throng. The Guild’s bargaining committee has shown willingness to accept a compromise so long as employee health care is protected. The current health plan is administered by a joint union-management trust fund with a long record of responsible performance. But now, for the first time, Hearst is refusing to offer enough money to close a deficit in the health system, figuring employees will accept big pay cuts to do the job. The Guild has offered to raise employee costs and cut benefits, but only if the management does its part. Instead, Hearst lawyers proposed to replace the quality HMO and PPO options now provided to Chronicle employees with a cut-rate high-deductible plan that would cause employees to bear huge cost increases for lower quality medical coverage. It would take only one minor accident or injury to cost a single employee at least $3,000 in the first year, while someone with a family would have to shell out twice that much. At the same time, Hearst offered a token raise, less than a quarter of what’s needed to cover just the health care deficit for one year, and refuses to discuss future years. The Chronicle and SFGate.com Guild membership agreed to concessions in 2005 and 2009 to help maintain quality journalism for the Bay Area. Now, employees say enough is enough: Basic health care and living standards of 250 families are at stake.